Costume is of the cheapest material possible. Bow tie fell apart while opening package, pants fit like mc hammer pants. 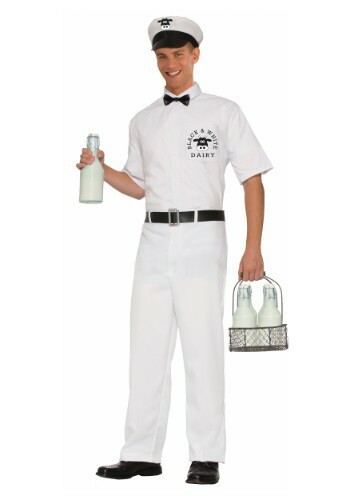 For starters, I'm 6'5", 260 lbs....because of that, I ordered the "big & tall" (XL) version of this costume. The good: good looking costume...paired it with my gf's "50's housewife" and got lots of laughs; the pants fit fine and were a workable length. The bad: everything else. The shirt wasn't TOO tight, but since there are no buttons (just velcro) it popped open frequently. The belt didn't go with the pants...pants rated up to 42" waist, but the belt is best for a 34" waist due to where the Velcro fastening was - couldn't use it and thus looked sloppy. Also...see through, so keep that in mind when choosing underwear. Lastly, it's surprisingly WARM. Overall, it was pretty disappointing.